When Was Cornelius Born Again? I once heard a man of Italian descent say that God’s message of salvation went to the Jews first, and then to the Italians. Technically, he was correct! But some debate has occurred over the centuries about what the conversion of Cornelius means for us today as it relates to salvation. It all centers around the question of when, exactly, Cornelius was saved? It is a legitimate question to ask. At what point in time did Cornelius and his family receive salvation? Let’s take a look at chapter 10 in the book of Acts and find out. When he had performed good deeds and prayed to God? No, that can’t be it. If that were the case, then why would God have an angel appear to Cornelius and instruct him to send for the Apostle Peter? Did God recognize that Cornelius was doing many things right? Sure he did! But there was no way Cornelius, no matter how much he did, was ever going to find the God he sought via his own efforts (Eph. 2:8-9). While Peter did say they needed to get “saved”, every serious Bible student I have spoken with agrees that receiving the gift of the Holy Spirit here equates to salvation. This fits perfectly with what Jesus said to Nicodemus in John 3 when he came at night to talk about salvation (Nick at Night?). Jesus described the salvation above as being “born of the Spirit” (John 3:8). So back to the account in Acts 10, what happened in the case of the first gentile convert? Now there’s an attention getter! No doubt, those who heard the message of salvation from Peter instantly believed and received the gift of the Holy Spirit. Those who had accompanied Peter were astonished and even Peter said ““Can anyone forbid water, that these should not be baptized who have received the Holy Spirit just as we have? 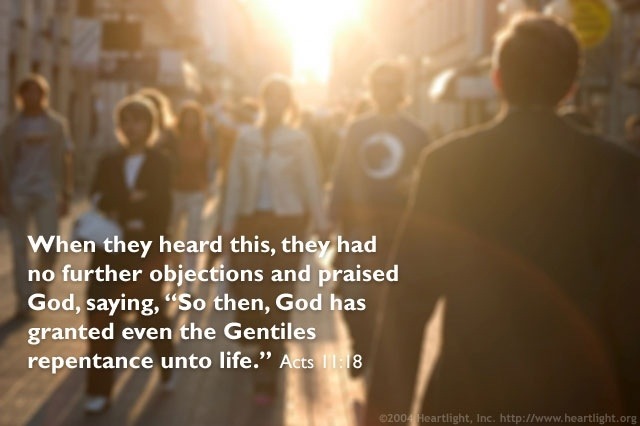 ” (Acts 10:47) Please notice that in this instance, if we follow the phrasing of Acts 2:38, Cornelius and his household were saved, and then obeyed the command to be baptized. And they were saved in the same way as the Apostles! But does this fit with the instructions given to the first Jewish converts in Acts 2? Well according to the Greek text, yes it does. How so? Well, it has to do with verb tenses and how they cause words in a sentence to relate to one another. To put it briefly, we know which verbs go together if their verb tenses match. Greek is a very precise language, and a thorough look at Acts 2:38 shows that the verb tenses for “repent” and “receive” are the same (2nd person plural), and the verb for “be baptized” is third person plural. So what that means is that repent is tied to receiving the Holy Spirit, while baptism is not. It is still a command, and is required, but is separate. And he told us how he had seen an angel standing in his house, who said to him, ‘Send men to Joppa, and call for Simon whose surname is Peter, who will tell you words by which you and all your household will be saved.’ (Acts 11:13, 14). Notice it was words, not actions, by which they will be saved. Peter went on to confirm that Cornelius and his household had received salvation in the same way as the apostles themselves had received it. And as I began to speak, the Holy Spirit fell upon them, as upon us at the beginning. Then I remembered the word of the Lord, how He said, ‘John indeed baptized with water, but you shall be baptized with the Holy Spirit.’ If therefore God gave them the same gift as He gave us when we believed on the Lord Jesus Christ, who was I that I could withstand God?” (Acts 11:15-17). The reaction was unanimous and joyous, and it also confirmed the mechanism that had caused these Gentiles to receive salvation. When they heard these things they became silent; and they glorified God, saying, “Then God has also granted to the Gentiles repentance to life.” (Acts 11:18). Yes, they believed (a change of mind), which caused repentance (a change of life), which was demonstrated by baptism (a change of allegiance). Does this diminish the importance of water baptism? Not in the least! Far from being an empty ritual, it acts as a marker in time, just like altars did in the Old Testament. It is a point of reference we, as well as those who are witnesses, can point back to and say, “you publicly swore your allegiance to Jesus Christ in water baptism. Don’t you dare forget it!” And may I say, someone who claims to be a Christian but refuses water baptism is demonstrating that they were never really saved. Also, there is no mention of a “sinners prayer” here either. What happened was a group of new believers being born from above when they heard the message of life in Christ Jesus and believed it in their hearts. When that occurred, they were immediately baptized.